As soon as spring arrives, spring bulbs planted in the fall start peeking out to say “hello.” But what if life just got too busy and you missed your fall bulb planting window? We don’t fault you for it— with so many holidays scrunched into that time of year, sometimes those fall bulbs, well, fall to the bottom of the list! Luckily, it’s not too late to incorporate bulbs into your garden. We’ll take you through all you need to know about buying and planting bulbs at this time of year, and the must-have varieties you’ve gotta try! Bulbs are a little different from your average seed or starter plant. If you’re new to bulbs, they’re somewhere right in the middle— there’s enough live, developed plant tissue in each bulb that the growing process happens quickly, but you still get the excitement of watching the plants emerge from the soil. To get the full experience, it’s important to choose high-quality bulbs that will mature into impressive, healthy displays. Start with healthy bulbs – Think of bulb shopping the way you might think of shopping for garlic or onions (which are, in fact, also bulbs). You want a plump, firm bulb that appears smooth and unblemished, with no soft or mushy spots. Larger bulbs are more likely to produce more dramatic blooms. While you’re shopping for bulbs, make sure to ask our team about fertilizers for your bulb varieties, so you have the right formula to enhance your garden during the height of the season. Check for good soil – Bulbs can be prone to rotting in very wet soils, so excellent drainage is key. Add some compost to add nice structure and slow-releasing nutrients to your bulb’s new home. If you purchased fertilizers with your blooms, you’ll want to apply them toward the end of May. Location, location, location! – Every BC native knows the value of the right location when choosing a home! For your bulbs, the right spot is an area with full sun exposure, ideally with a little shelter from strong winds. Plant properly – As a rule of thumb, bulbs should be planted with the pointed end facing the sky. This is where the bulb will grow from, and while the bulb will still grow if pointed in the wrong direction, it will cause a delay in emerging time and your flowers may come in later than you expect. There are exceptions to every rule, of course, so make sure to double-check with our garden specialists when taking home a new bulb variety for the first time. There are two main groups of flowering bulbs: spring-blooming bulbs and summer-blooming bulbs. Your planting window for each is very different, and if you plant at the wrong time, you might miss the show! Spring-blooming bulbs, as we mentioned, are best planted in the fall around October or early November. Through the winter season, the chill puts the bulb in a dormant state as it lies in wait for the spring. Once the soil reaches a warmer temperature, the bulb bursts into action as the warmth triggers their rapid development process. If you weren’t tuned in to this process last fall, our garden centre carries bulbs that have been carefully chilled through the winter so they can still be planted from now until the end of April. If you wait past then, better to hold off on planting your spring bulbs until the season ends. Summer blooming bulbs, on the other hand, bloom in warmer soil. You can plant these later on in the season after your spring bulb window closes, and they’ll blossom as the weather gets more and more temperate. While there are plenty of bulb varieties out there, these are the absolute classics that we think every gardener should try growing at least once. Plus, you still have lots of time to get these in the ground! Dahlias make a stunning entrance in the summer with their gorgeous sunburst-shaped blooms. Dahlias come in colours ranging the entire spectrum, and can vary in their flower size, shape, and texture. Some of the more top-heavy varieties may require staking for support. Plant dahlias about 6-8 inches deep, or deep enough that you only require 2-3 inches of soil to cover them. Dahlias are the official flowers of Mexico, so it stands to reason they strongly prefer warm soil. You may be best off planting them now in containers, then waiting until the temperatures outside reach a consistent 20°C or more before transplanting them to a sunny spot. Oriental Lilies make ultra-dramatic flowers with their vibrant colours and intricately patterned petals. Many oriental lily varieties are pollen-heavy which can stain everything they touch. Choose a pollen-free variety, like “China Girl,” if stains or pollen allergies are a concern for you. Plant oriental lily bulbs right after the last frost date has passed (that’s April 14th for us) and water them well. Good soil drainage is super important for these lilies, as they need to be kept moist but not too wet. An excessively wet bulb is prone to rotting. 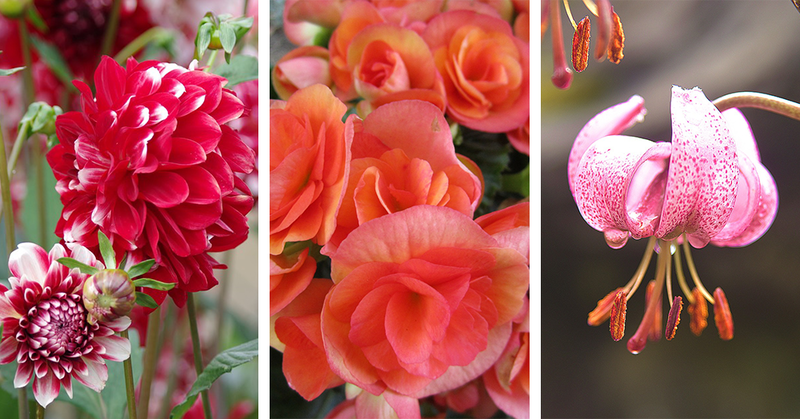 Tuberous Begonias are some of the most versatile summer-blooming bulbs around. Thanks to their delicate flowers and the trailing habit of most begonia varieties, they work splendidly in everything from hanging baskets, containers, flower beds, and even indoors as houseplants. Not only are their colourful flowers beautiful to look at, you can also choose varieties with different degrees of “bronzing” on their foliage to coordinate with cooler or warmer colour palettes. These begonias do best when started from pots indoors, and transplanted into an area with partial shade when the soil warms up. Gladiolus grow into tall, stately flower spikes filled with vibrant blooms. “Glads” are fairly tolerant of cooler temperatures, and they can be planted a little ahead of the last frost date. You can plant a few corms every week to stage out the blooming period, which should occur 70-90 days after planting. Gladiolus can be prone to fungal infection, so keep an eye on them as they begin to grow. Keep them moist by mulching your gladiolus plants after they sprout, which will also combat weeds. When provided with regular watering, a dose of fertilizer, and the right soil, bulbs don’t need much from you to do what they do best. However, to keep them coming back, there are a few steps you can take. Cut flower stalks down after their blooms have faded. You can clip them an inch or so off the ground, but it’s best to leave any foliage standing to give the plant a chance to photosynthesize energy for the bulb buried beneath. When fall comes around, dig up your bulbs to store them for next year. Dig holes at least six inches away from the stalks to avoid cutting the bulbs, and gently loosen the soil around them as you ease out the roots. Shake them off gently and allow them to air-dry somewhere cool, like in a covered sunroom or garage. They’ll need to sit for about a week to “harden off” for storage. You can then store the bulbs indoors in a dry spot with excellent airflow that’s just a little cooler than room temperature. A mesh bag is a perfect container to keep them in over the winter. When you’re ready to plant them next season, test them for weight. Any that feel light and hollow are no longer viable, but bulbs that are still firm and plump to the touch are good to re-plant. Once you get familiar with bulbs, you’ll inevitably start to appreciate how special and different they are from the rest of the flowers in your garden. The shapes and colours of their flowers are some of the most sculptural of any in our growing zone, and the colours and fragrances they offer are hard to replace. 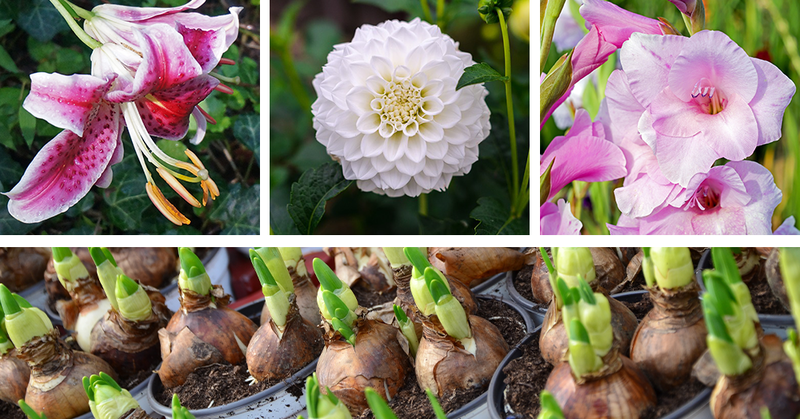 Ask us about the new spring and summer bulb varieties we’re carrying for 2019— we couldn’t be more excited to help you fall in love with these garden essentials!